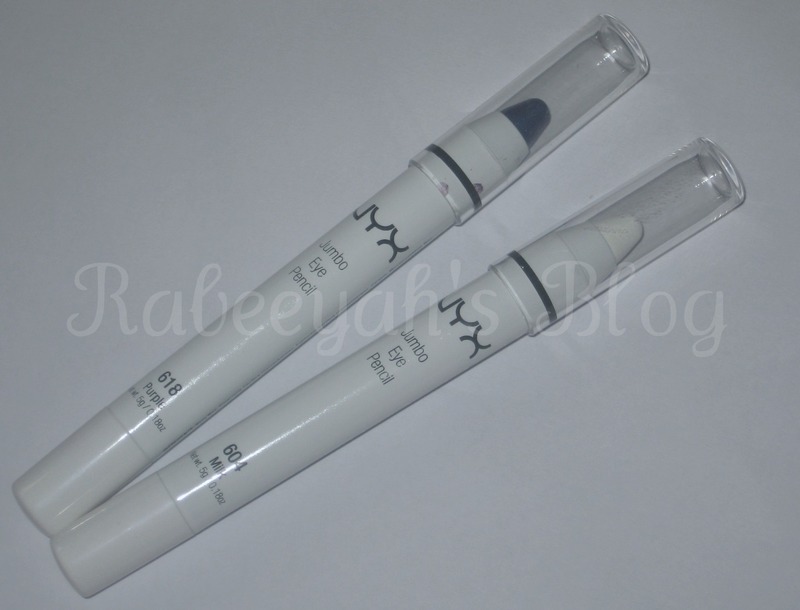 Today, I am going to review NYX Cosmetics Jumbo eye pencils. I have been hearing good reviews about it. I always wanted to try them out, but then I had an eye shadow base already. Now, I know the difference between an eye shadow base with no color and a colored eye shadow pencil, which can be used as a base. These pencils can be used as an eye shadow and eye liner. But, they can be used as an eye shadow base too. Trust me, it looks amazing! The Jumbo pencils are one of the top selling item from NYX Cosmetics collection. I bought two of them. MILK and PURPLE. 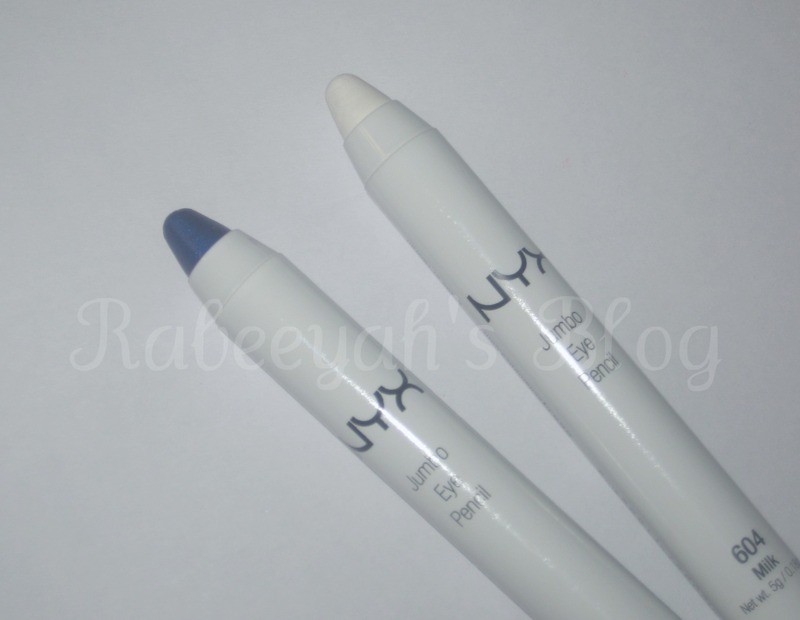 Milk is one jumbo pencil from NYX that every girl has it and who doesn't, should have it. NYX COSMETICS : A blend of both worlds, an eye shadow and eye liner in one! Jumbo eye pencils glide on like silk, blends easily and lasts all day. They come in 28 beautiful colors. I will agree with what NYX has to say about their jumbo pencils. They are really creamy and pigmented. Glides on very easily on your eyes and blends very well. It does stays for couple of hours without creasing (which is the best part). The Milk pencil can not be used as an eye liner on the lids or as an eye shadow. The white color liner or eye shadow will look quite dramatic, alone. But, it is amazing as an eye shadow base for any light-bright color. It really pops up the color and makes it more vibrant. It blends easily one the lids and makes the eye shadow last long, making it look bright. It is a matte white color. You can also use in your tear ducts to highlight it, on your brow bones and even in your water line. This is the look I created, using MILK as a base and Misty green as an eye shadow. You can see the difference. Though it is not that visible, but in real you can really see a huge difference. The left eye has MILK jumbo pencil as the base under the eye shadow, whereas the right eye has no base. See, how the color is popping out and looks vibrant. It also helps the color to stay longer, without creasing. Purple is a nice bright color, which can be used on itself alone, just as an eye liner or eye shadow. It is a very pretty purple color with shimmer/sheen. The sheen gives a metallic finish. You will not see too much shine once you have applied it. It is a nice bright purple color, which can be used on the lower eye line as well. Same I did with the PURPLE Jumbo pencil. I applied it as a base. You can see the left eye more brighter than the right eye. I have applied more coats of eye shadow on the right eye than on the left eye. As the right eye was not picking up the color that well. Whereas, the one with Purple as a base, picked up really well. 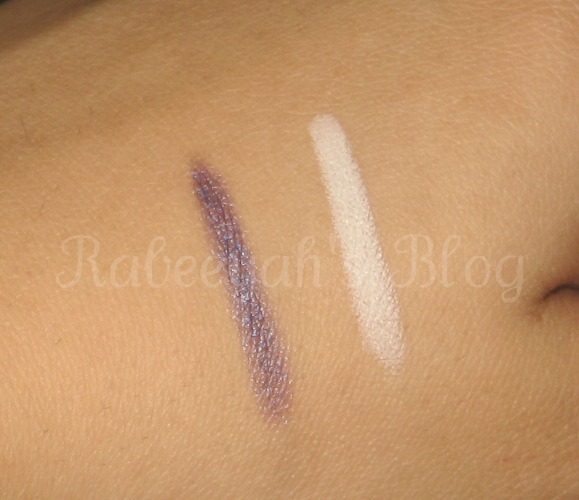 Here are the swatches of both the colors. You can actually see the pigmentation of both of them. Milk is more pigmented as compared to purple. But after 3 - 4 strokes, the purple color comes out really well - purple is more sheer. You can see the metallic shade of purple. It is not metallic, but as I said, it has sparkles in it which makes it look metallic. I hope you liked my review. If you want to request any tutorials using these pencils, please feel free to request. why we cant use it on waterline? I love these pencils :) thanks for the wonderful post. great review dear :] I love your blending skills!! you can really see the difference in the brightness. Cant wait to get my hands on the white one! Heard alot of great things about it! And nice eye make up! I especially liked the purple look! You should do more EOTDs! You did such a pretty look and def the difference is noticable. great review!